Sprinter Usain Bolt Says He'll Retire After 2016 Olympics : The Two-Way The 100 and 200 meters champion says he'd like to win gold at Rio de Janeiro and the Commonwealth Games before hanging up his spikes. Usain Bolt of Jamaica sprints to victory and a new world record in the men's 4x100 meter relay at the 2011 IAAF World Athletics Championships in Daegu, South Korea. Usain Bolt, the Jamaican sprinter widely regarded as the fastest man alive, says he's thinking about hanging up his running shoes after the 2016 Olympics in Brazil. The 27-year-old holds world records in the 100 and 200 meters and has six Olympic gold medals. But Bolt says that before retiring, he'd like to win gold in Rio de Janeiro as well as at next year's Commonwealth Games and best his own world record in the 200. According to The Associated Press, Bolt says he thinks "it will be a good time to retire, on top and just been dominating for so long." He adds that if he wants "to be among the greats of (Muhammad) Ali and Pele and all these guys, I have to continue dominating until I retire." 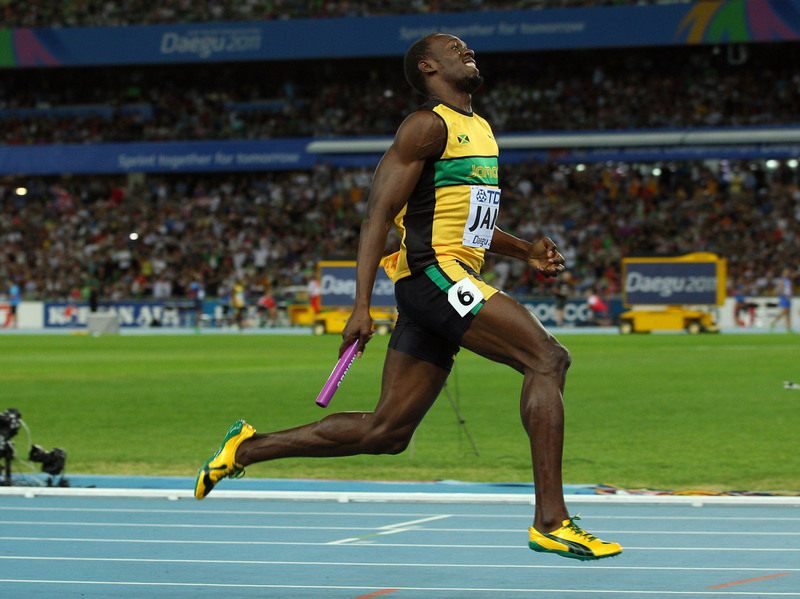 At last month's World Championships in Moscow, Bolt won the 200 meters just six days after winning the 100. And last year, he became the first sprinter to defend his titles in both events at back-to-back Olympics. He also won gold as part of the 4x100 meter relay at the 2012 London Games. In July, Somali-born British runner Mo Farah, who holds titles in the 10,000 meters and 5,000 meters, challenged Bolt to a 600 or 800 meter charity race, an idea that Bolt said "sounds fun."